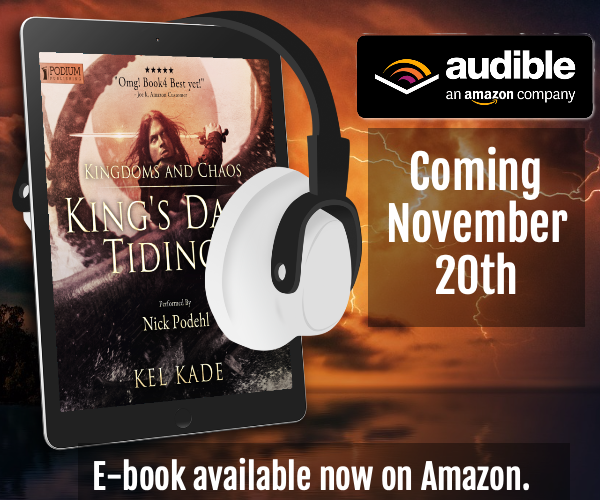 “Kingdoms and Chaos” (KDT4) audiobook will be available November 20th. The pre-order should be available in the next couple of weeks. E-book available for purchase now! I just want to hug Rez, for 3 whole minutes, rocking back and forth. Yes, I know he’d eviscerate me but I just want to HUG HIM! Yep…used my last credit for it. Thank Goodness you are supporting audible. I hate to say it but I hardly have time to read now a days. I love the series and love how almost autistic Rezkin is although I had to admit the book 2 tourney was the best part of the series seconded by the part with the assassin guild. And Nick Podeh is a true voice artist. I don’t give them enough credit but he is very good.